“We are going to achieve pharmaceutical sovereignty,” Maduro said. August 26 (teleSUR) Venezuelan President Nicolas Maduro has asked for the price of medicines to be regulated as a part of the government’s recovery and economic prosperity plan. “Set the maximum retail prices of all medicines in the country in accordance with the updated economic recovery plan,” he said during a meeting with health workers that was broadcast on television and radio. “We are going to achieve pharmaceutical sovereignty and security, and we must stabilize, normalize (and) improve,” how we operate the head of state stressed. “We have imported enough medicines to care for our people,” he said after denouncing economic sanctions imposed on the country by the United States and European Union. He said the sanctions have “kidnapped USD$1.4 billion” from the Venezuelan economy. 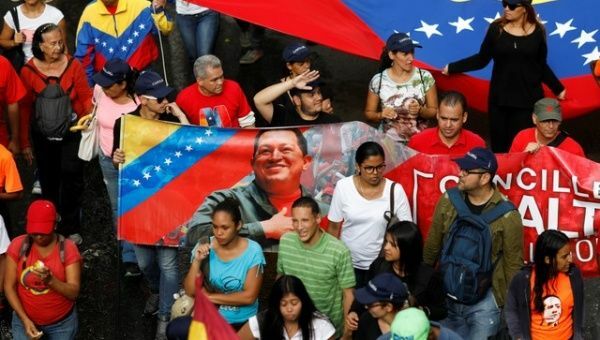 Venezuelans took to the streets of Caracas earlier this week in a show of support for the new economic reforms that took effect as part of the government’s Economic Recovery Plan. The measures seek to fight back against the economic war and sanctions targeting Venezuela by the U.S., European Union, and their regional right-wing allies and address the subsequent financial struggles facing the country. The recently introduced “Sovereign Bolívar” currency began circulation on August 20 as one of the first measures in Venezuela’s Economic Recovery Plan. The currency is pegged to the country’s cryptocurrency, the Petro, which is worth 3,600 sovereign bolivares.